Thermal dispersion switches use similar principles as thermal mass flow meters. 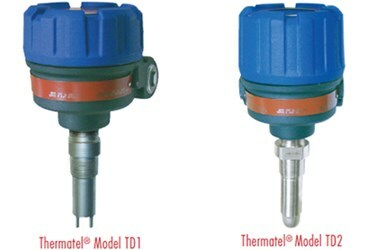 Fluid carries heat away from the probe tip reducing the temperature difference between a heated resistance temperature detector (RTD) and a reference RTD. As the temperature difference increases or decreases due to heat transfer, the set point is reached and the relay de-energizes. Manufacturers will refer to the switch being in “alarm” at set point. How the relay is wired (NC-CO or NO-CO) depends on the needs of the application. High or low flows can both be detected by thermal dispersion switches. For the purpose of this paper, it will be liquid flows as opposed to gas, and low flow detection that is desired. Running pumps in a dry state can damage parts or cause cavitation in centrifugal pumps. Replacement parts can add up to thousands of dollars. These costs do not include inefficiencies in pump operation or downtime that affects production or operation. There are many technologies that can perform the function of pump protection. Flow meters can be used, but a continuous flow measurement is not always needed and flow meters typically cost more than switches.